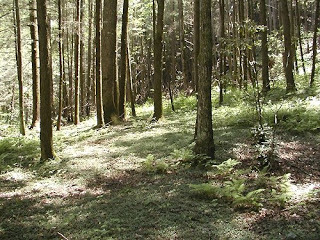 About a third of Curtis Creek Road is unpaved heading south from the Blue Ridge Parkway, and the final two-thirds are paved, with miles of pristine forest all around and spots designated for camping and fishing along Curtis Creek. 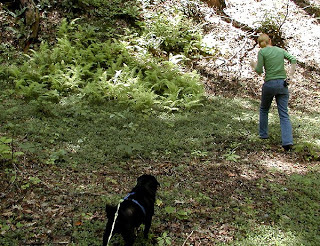 Different geocachers have hidden at least nine caches along or near Curtis Creek Road, and we set out to find one called 3/1/1911, hidden by the well-known geocacher named OzGuff. This particular geocache is hidden close (but not too close) to the sign that commemorates the first tract of land purchased to become a National Forest in the United States. More than 8,000 acres were purchased on March 1, 1911, as part of the Weeks Law. 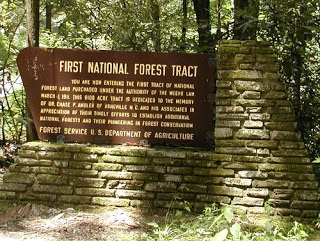 The law, which was used to create new national forests, authorized the purchase of public lands in order to protect watersheds of navigable streams, especially in the east. 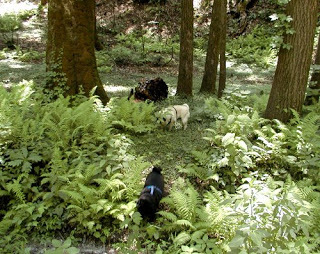 This geocache wasn’t as challenging as we thought it might be (or maybe we’re getting better at geocaching…), so after we signed the log and re-hid the cache, the pugs had some quality sniffing time in the forest and we got to enjoy the quiet of the woods before heading back home. Don’t forget, if you are in the area and want to do some geocaching, on our Inn Turns 10 page, we’ve compiled a list of ten caches hidden around the Inn on Mill Creek, along with a link to the more than 125 caches hidden within ten miles of the Inn. This entry was posted in Uncategorized and tagged geocaching, innkeepers and innpugs, Old Fort / Andrews Geyser, outdoors by Inn on Mill Creek. Bookmark the permalink.